JamieG had the most liked content! For sale is my Miniplane Top 80. It's had plenty of use but is still in excellent condition and has been well maintained. What size wing are you flying? 116kg all up flying an original Snake 22. Level flight and trimmers in, I have the same rpm as I did on my old Synth 29. Much easier to launch also. Really enjoyed that Steve, thanks. Great to see you at Parafest and will give you a shout when I'm up your way again. Have you got any Welsh flags Simon? Mine does this too, quite normal, just the fuel slowly siphoning back into the tank over time. Blow into the tank via the vent to pressure it up a little, quickly block the vent with your finger then tickle the carb diaphragm until the filter fills up and you see the fuel in the fuel line arrive at the carb. Really enjoyed reading that Steve, fair play, that was a great weekend! Mark and the marshalls did a fantastic job, and I can't wait until the next one. Maybe Mark could organise an autumn Parafest too, twice a year ..wahay! My wife has just got back from where you live. She has family there. Its very rare indeed but next time I visit I will make sure to give you a nod for a beer. Nice one Simon, yes, bring your gear and I can give you a tour of Pembrokeshire. Yes, nice job with the new website especially the member map. Nice one! Yes, I take all three as they are constantly pestering me to go flying Simon. I first took them up in May last year, something I'd wanted to do for a long time and after lots of careful planning it was a great success. I find the kids are much easier to get off the ground than the adults as they do exactly what you say and can be easily programmed. Have taken them all up many times now but only when conditions are perfect. (One at a time that is) I occasionally take the wife up too and we have a fly around our village in Pembrokeshire. Feel so lucky to be doing this sport, it's amazing isn't it. Don't want to go on too much but here's a few vids I've done. 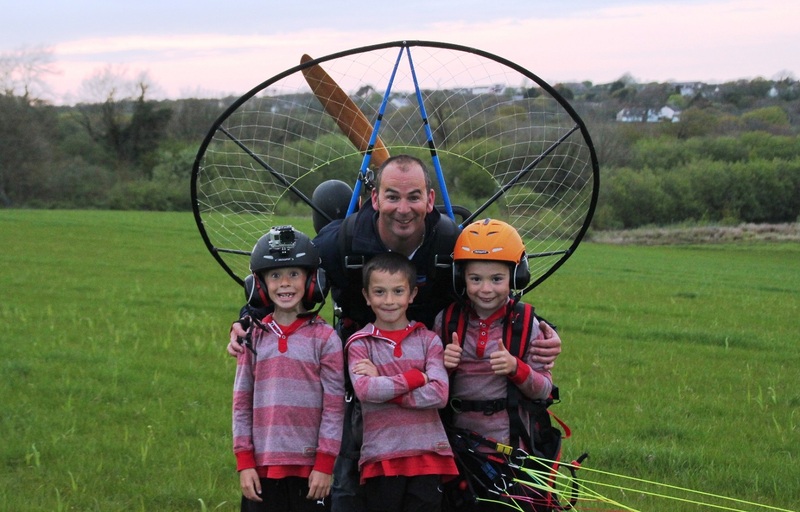 This is a pic of me and one of my triplet boys flying over our village called Hook, on the Cleddau estuary in Pembrokeshire.